These meatballs. Ohhhhh Mah Gawd. 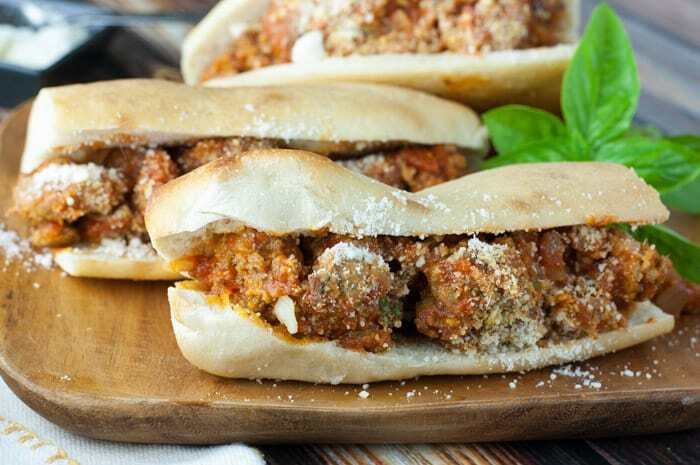 This tempting adulteress Broken Meatball Sub Sandwich will lure you with just one look. This meat is so moist and flavorful with just the right amount of crisp on the outside. How do you make these bad boys? I mean, girls. They were discovered by trying to snob up some jarred sauce. I added some sautéed onions and garlic and then experimented with the best meatballs a snob could make on short notice. I discovered 3 tricks to making them perfect every time. And yes (like duh) you’ll be privy to these snobby tricks! Why broken? I broke the meatballs down into smaller pieces before searing them because when you’ve got large balls (<– sorry) you tend to do a lot of gutsy things (again so so sorry). Large meatballs have some negatives. They squeeze out of the bread too easily. You gotta smash them down. And you have less sauce coverage with larger meatballs. It’s science, man. So I broke ’em. 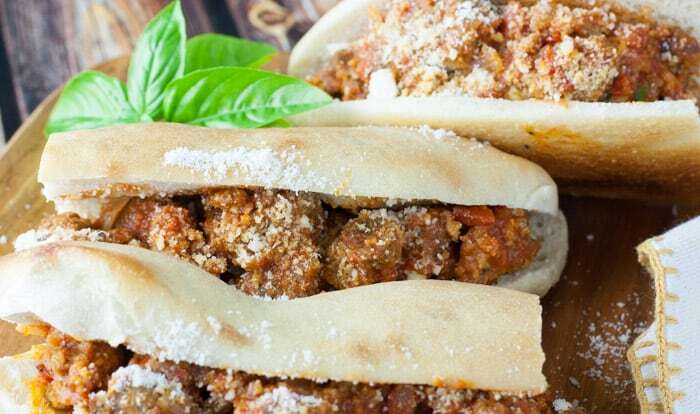 Enter the Broken Meatball Sub Sandwich. You want them moist. This means lots of egg. More than you would think. I’ve tried it with less egg. No bueno. A gazillion cups of bread crumbs. Okay fine. 1 cup. But it’s A LOT. The more bread crumbs the merrier. I’ve tried these meatballs with less breadcrumbs. No bueno. I like saying no bueno. Without extra bread crumbs the meat is just sort of “meaty” (is that a thing?) or like chomping on a hamburger with no flavor. Sear the outside of the meatballs well. It seals in the moisture and gives a nice flavor to them. Sear, rotate. Sear, rotate. Bueno. I wish I would have gotten more pictures. Ya know, different angles. More ooohhs and aahhhs. But this meatball sub begs to be eaten, not photographed. 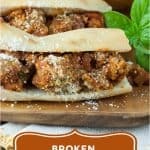 You DO NOT argue with the Broken Meatball Sub Sandwich. Pick up sub or hoagie rolls at your local grocery store or your favorite sub shop. Our favorite local subs are from Zeiderelli’s in PA and they make the BEST bread. They sold me this sub sandwich bread for a few dollars and it really is better than what they sell at the grocery store. 1 pound 80/20 ground beef (you could buy leaner beef if you wish but I wouldn’t go any leaner than 85/15. 80/20 tastes best). Put ground beef and eggs in a large bowl to start bringing them to room temperature. Set aside. Heat 2 tablespoons of olive oil in a large nonstick skillet over medium-low heat. Add onions to skillet and 1/4 teaspoon ground sea salt and 10 turns of ground pepper and stir. Sauté onions slowly (about 10-15 minutes or until translucent and just turning light brown). Pull onions out of the oil with a slotted spoon (leaving oil behind) and set aside. To the large bowl of ground beef and egg you set aside earlier, add cheese, worcestershire, basil, parsley, oregano, granulated onion, bread crumbs, 1 teaspoon garlic, 20 turns ground pepper, and 1/8 teaspoon salt. Combine everything together with your hands just until mixed. You don’t want to overwork it. After mixing, generously sprinkle salt over the meat without mixing it in. Flip meat over and sprinkle salt on other side. Preheat the same skillet you used for the onions that still has the oil in it over medium heat. Add another tablespoon of oil and 1 pat of butter to pan. 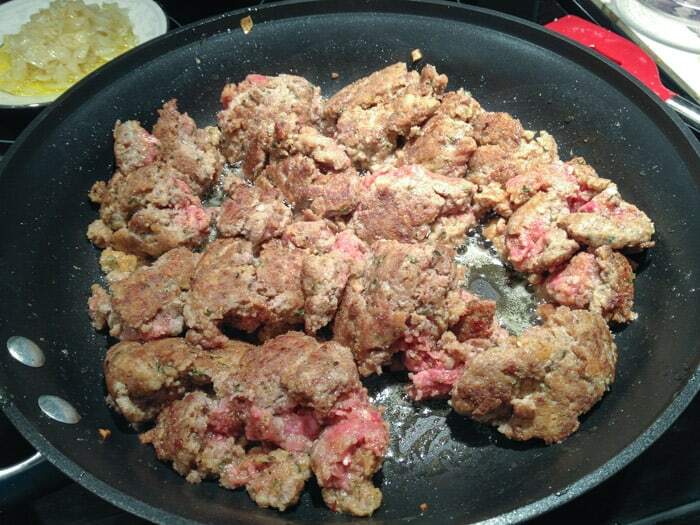 Once the pan is heated, add meat to skillet and use a spatula to break apart the meat into somewhat smaller pieces. (see photos below). Allow meat to sear until nicely browned and then start to flip the pieces over. (At this point, I might add a little more salt over the meat to the broken open areas.) Don’t over-stir your meat. You want to give it time to sear on the edges before turning the pieces over. Once the meat is mostly cooked, I sometimes break the meat down a little more into smaller pieces if some are too big (see picture below) and then let the freshly cut pieces sear a little more. Once the meat is completely seared on all sides and cooked through, lower the heat to medium-low and stir in the sautéed onions. 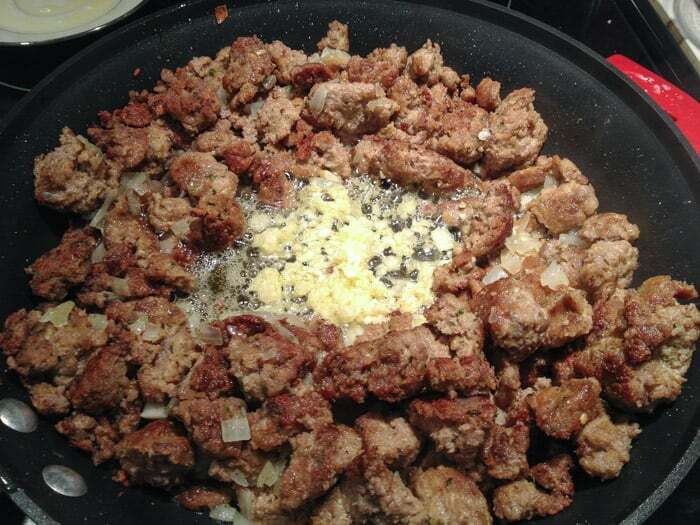 Push the browned meat to the sides of the pan to create a little open area in the center of the pan and add the rest of the minced garlic to the center. Let garlic sauté for 1 minute, then add your jar of pasta sauce. Turn heat to low and stir everything together. Let everything simmer together on low for about 20 minutes, stirring occasionally. Remove skillet from heat and serve with hoagie rolls and sprinkled cheese. 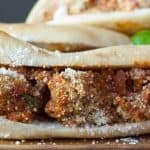 More great recipes at www.thekitchensnob.com! 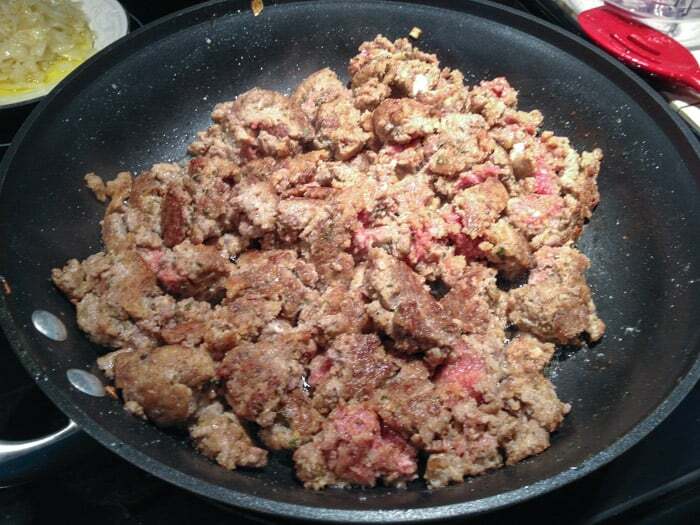 I know the pics below aren’t in great focus but I wanted to show some of the steps for browning the meatballs. This is after I’ve put the meat in and broken the meat up with a silicone spatula, like this one (affiliate link). After I break it up, I season it one more time with ground sea salt. After the meat has seared on almost all sides, I break it down one more time. I like my broken meatballs on the smaller side. More crusty edges! After the meat is done and I’ve stirred in the onions, I create a small hole in the center of the pan to saute the garlic for 1 minute before stirring it all together. Thanks Fairly Good Mother! I highly recommend making these. Hope you’re well email buddy, enjoy the weekend! Hi Pamela! I bet your rooftop tomatoes make a great sauce! 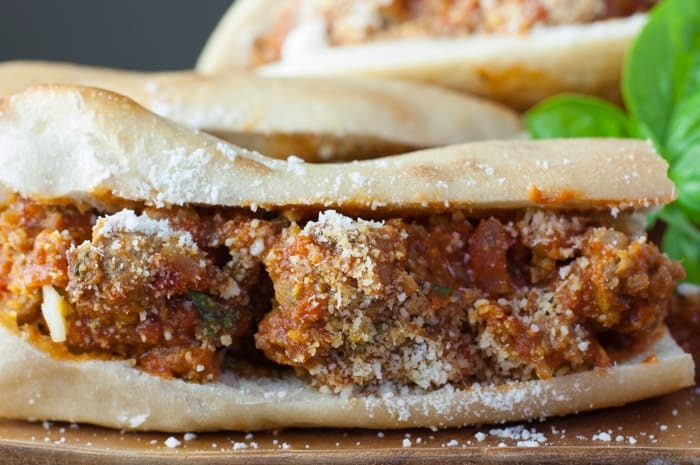 YUM…..I am going to make us some of those sandwiches with my homemade meatballs and sauce! DELICIOSO!